I recently decided to upgrade my chainsaw protective equipment. As it turns out, safety glasses don't really protect from kickback. Who would have figured? For my own safety I decided to upgrade to a Stihl Forestry Helmet. The Stihl will protect me from small debris hitting my face, impact from above, and my ears from the noise my power tools generate. As a bonus I plan on using the helmet with my string trimmer. The trimmer won't have any kickback, but it does produce plenty of noise and flying debris. The helmet is also a bit of a fashion statement in the suburbs. 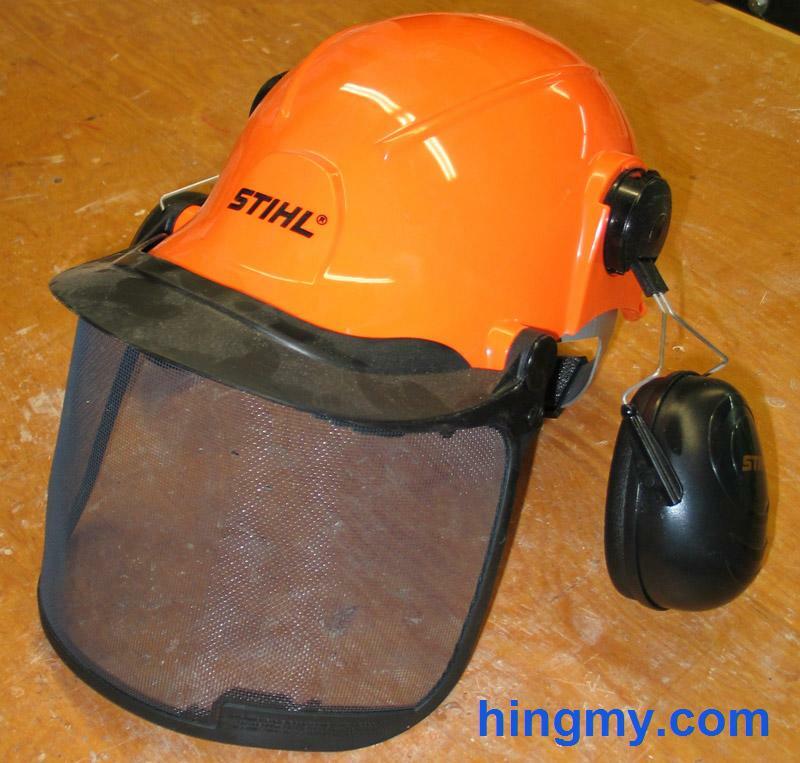 The Stihl Forestry Hardhat is a ANSI S89.1-1997 Type I helmet. It protects the user from impact to the top of the head, spine, and neck. 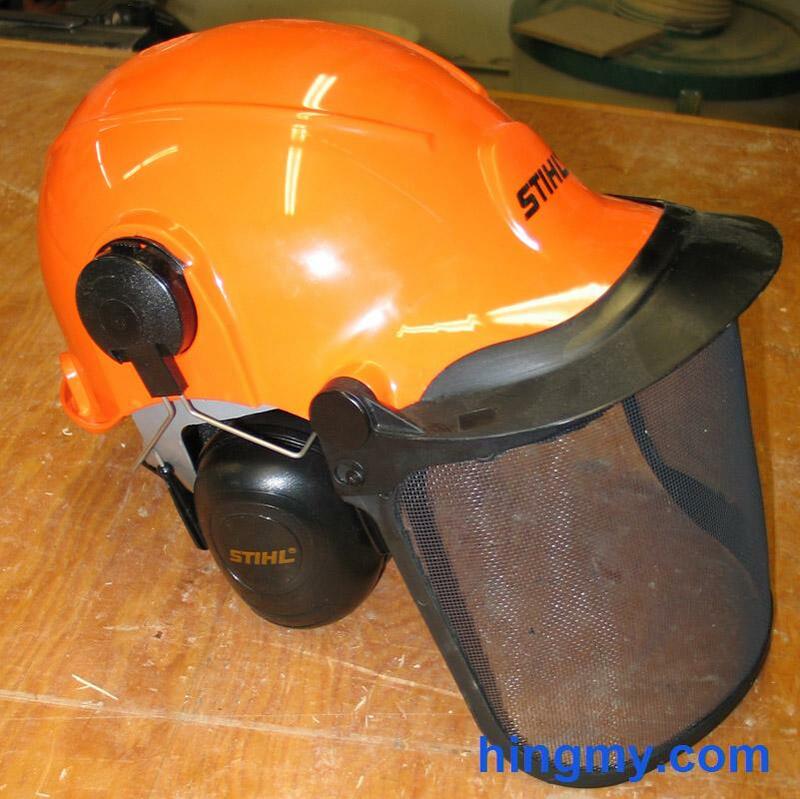 As a rated helmet design the protection the Stihl Forestry Helmet offers should be considered adequate. The sub ratings of class C/G add a layer of protection against electrical currents, which I consider a bonus rather than a feature of the helmet. If you are worried about electrical currents, there are better helmet options for you in the market. 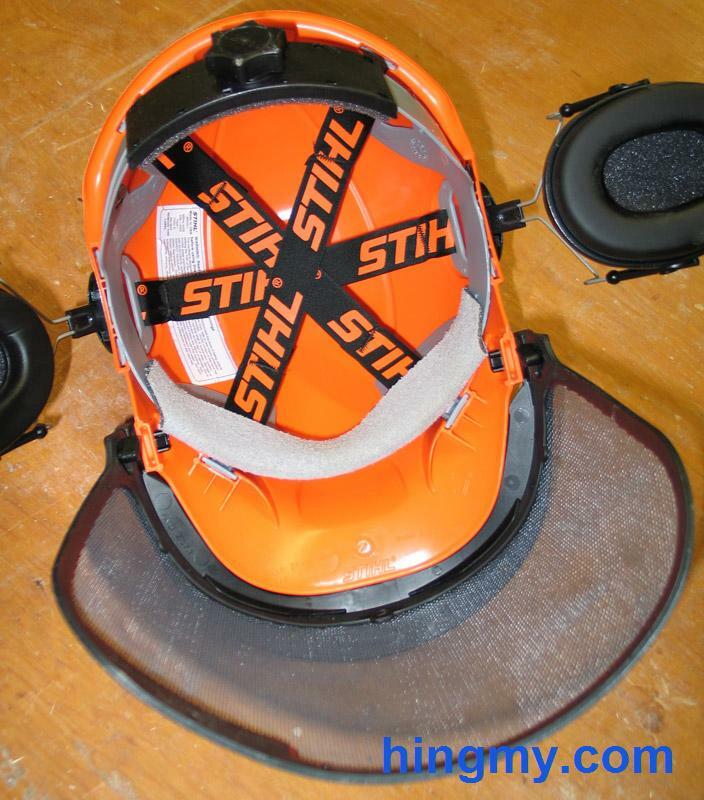 The Stihl uses a 6-point strap system to suspend the shell of the helmet above the user's head. This is design is used by just about every hardhat available today. A knob at the back of the helmet adjusts the circumference of the suspension system. The straps are effective and allow for a great fit. The straps on the Stihl adjust to fit user of just about every size and shape. The helmet fits my larger than average head just fine and with plenty of room to spare on the straps. Once adjusted, the straps of the helmet stay in place. You won't have to readjust anything during normal use. The front strap incorporates a sweat band. This band unfortunately feels noticeably warmer than the bare strap. During a full day of work the band soaks up a good amount of sweat. So much sweat, in fact, that you'll have to clean the band daily. If you do not, your helmet will start to smell in a very short amount of time. If you do not like to use the band, you can remove it. The headband can be machine washed. The face shield is made from a metal mesh. It deflects even fine debris. The operator can breathe normally. The helmet has been engineered by Stihl to withstand the impact of a chainsaw kickback accident. Having the helmet in my hand I do believe that it will withstand such an impact, but it'll probably only do it once. Small debris will not damage the face shield. Since it's made from metal mesh, there are no scratches to worry about. The hinges on the face shield make it easy to lift the face shield out of the way. It will stay in any position from fully closed to fully open. The hinges appear to be solid. I expect the two of them to last the life of the helmet. One of the best things about the shield is that it still allows air to freely circulate around your face. Working with the helmet on in the summer heat is comfortable. That's an important consideration since comfortable safety gear is more likely to be used. Ear protection on the Stihl is fully adjustable. The muffs adjust up and down and in and out. I really like the in/out adjustment, which is done with a slider on the top of the mounting arm. The slider makes it easy to adjust the amount pressure the ear muffs exert against the side of my head. The muffs also tilt up and out of the way to make it possible to have unencumbered conversations on the job site. 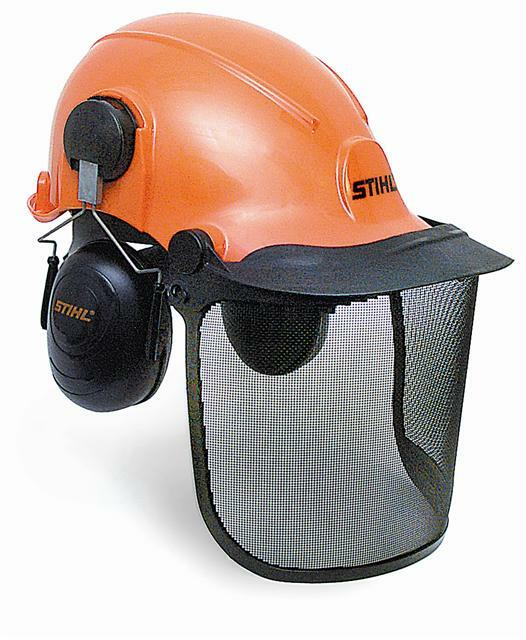 Stihl claims that that the helmet offers 24dB of noise reduction, which is the ANSI S3.19-1974 standard. The ear muffs are large and of good build quality. The mounting arms, however, are mostly plastic. I can see them failing before the rest of the helmet does, but not before they have been through a few seasons. Should my prediction be correct Stihl sells replacement parts for the helmet, including new ear muff assemblies. I have owned by helmet for several years now. It stays in place and does not shift. There is nothing to adjust. After a few minutes working the helmet becomes an afterthought, like any good equipment. This helmet lets you do what you need to do, and it'll protect you when you need to be protected. After a few years of arguably light use the helmet still functions as if it was new. All the hinges and plastic parts still operate without trouble. The face shield is a clear as ever, even after protecting me from countless small missiles. Overall the Stihl Forestry Helmetis a good product. With ANSI ratings in all the areas that matter you can be assured that the helmet will protect you. While it's made for use in the forest, it's a great option for protecting yourself while working in the yard. The Stihl Forestry Helmet incorporates head, face, and hearing protection in an easy to format. I will be running around the suburbs looking like I mean business. This helmet is a great value in safety gear.